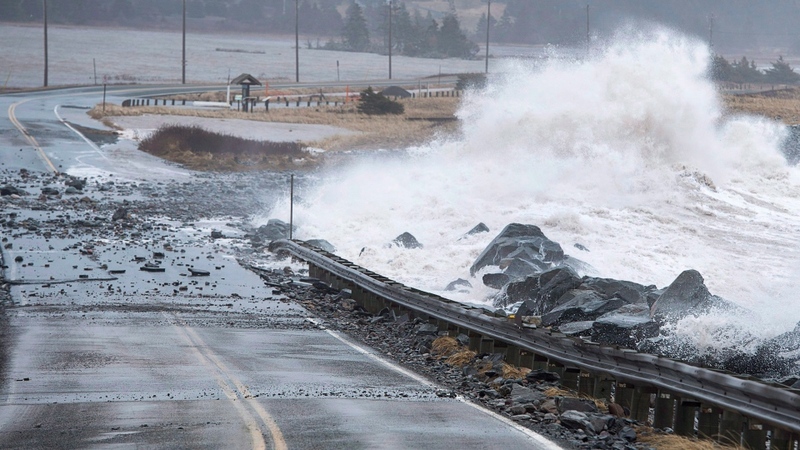 HALIFAX -- Much of Atlantic Canada is being pummelled with heavy winds and a downpour on Saturday, swamping some areas with extensive flooding and causing two Newfoundland towns to declare a state of emergency. Environment Canada said a low-pressure system slowly tracked across the East Coast on Saturday, drenching the region in heavy rains. In southern New Brunswick, total rainfall amounts had exceeded 50 millimetres in some areas by Saturday afternoon, with isolated reports of more than 100 millimetres, according to the weather agency. Forecasters said southwestern Nova Scotia and Newfoundland's south coast could be hit with up to 50 millimetres of rain. The weather agency said the frozen ground has a reduced ability to absorb the deluge, which, combined with unseasonably mild temperatures in some areas, could lead to substantial snowmelt and runoff. Two Newfoundland towns declared states of emergency due to the heavy rainfall and melted snow. The mayor of Corner Brook, N.L., declared a state of emergency on Saturday afternoon due to heavy rainfall and snow melting, infrastructure damage and an "overwhelmed" municipal drainage system. "We are dealing with a very severe rainfall event," Jim Parsons said in a statement. "All available personnel are working to try and mitigate further damage. For the time being, we ask residents to stay off the streets in affected areas, if possible." The town of Humber Arm South in Newfoundland's Bay of Islands posted to Facebook early Saturday evening saying a state of emergency had been declared from Frenchman's Cove to Halfway Point and a fire back-up plan is in place. Newfoundland and Labrador Premier Dwight Ball tweeted photos from a constituent of crews tending to a washed-out stretch of the Trans-Canada Highway, two gaping holes flanking one of the lanes on either side as muddy water rushed underneath. "Thank you to all of the contractors and crew for the incredible hard work today," said Ball. The province's Transportation and Works Department tweeted that several routes had been closed due to severe flooding, plugged ditches, lost guardrails and asphalt and an "underground hole area." Officials said the Trans-Canada Highway west of Hampden Junction is closed due to severe flooding and a washout. Newfoundland and Labrador Hydro tweeted that some communities on the Northern Peninsula were without power because of an outage caused by a landslide near Woody Point, which they estimated would be restored by Saturday evening. The utility said that restoration efforts had been delayed due to high winds and road closures. Sandy Dunphy said she was driving home on Saturday morning when she saw a hole had opened up on the highway near Little Rapids, N.L. Initially, Dunphy thought the province's Transportation Department was trying to allow for more runoff, she said, but then she realized the road was not hanging precariously over rushing water by design. She said in a Facebook message that the water "ate" the soil under the highway, so she tried to stop traffic as she waited for provincial authorities to make their way to the scene. Dunphy took a video as a piece of drooping pavement collapsed into the hole and was swept away by the water. Social media users have posted photos of a shed and truck partially submerged in murky water in Benoit's Cove, N.L. Resident Vaughn Keeping said a mudslide had blocked access to the only road in town, and excavators and bulldozers had to be brought in to clear the way. More than 20,000 Maritimers were without power on Saturday morning. By around 7:00 p.m., Nova Scotia Power said electricity to around 1,800 customers had been affected by outages, and New Brunswick's power utility said around 5,300 people were blacked out. Greg MacCallum of the New Brunswick Emergency Measures Organization told reporters on Saturday afternoon the rains have caused localized flooding and have damaged roads as well as the roofing of some houses. Several rivers are at risk of overflowing and are being monitored, MacCallum said, adding that people should be on alert for signs of ice jams. Town officials in Sussex, N.B., advised residents on a few streets to evacuate their homes due to the risk of flooding, but MacCallum said that by Saturday afternoon it appeared the river had crested and people would likely be able to return to their homes soon. He said Hoyt, N.B., had seen significant flooding, and boats would be made available to the local fire department in the event people weren't able to evacuate. He said an "extensive" list of roads had been closed in the southern part of the province, and warned drivers to avoid any road covered in water, because there could be sinkholes and washouts. "We want to make sure people don't take any unnecessary trips," MacCallum said. "If you must be on the road, be sure to check for road conditions and obey all road signs." NB Power spokesperson Marc Belliveau told reporters forceful gusts have been the primary cause of the outages, with trees knocking out power lines in some areas. Dozens of crews are working to get customers back on the grid, said Belliveau, and while the situation is "fluid," it seems manageable enough that he estimates most customers could have their power back by the end of the day. Environment Canada said plummeting temperatures could cause pooling water to ice over as flash freezes take hold in some areas later in the day.